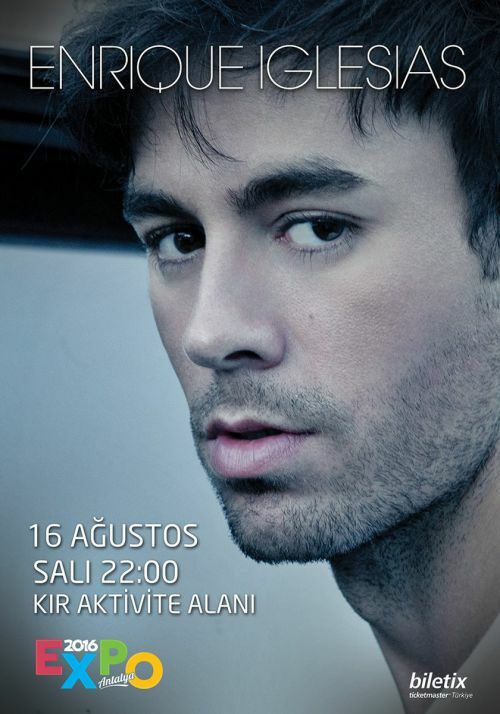 Having opened its doors with the motto: "A green world for future generations," EXPO 2016 Antalya will host Spanish singer, record producer and actor Enrique Iglesias.The musician will perform his cult songs on the stage at EXPO in Antalya. Enrique Iglesias, son of legendary crooner Julio Iglesias, became a worldwide sensation in 2001 when his breakout hit “Hero” sold over a million copies. Iglesias's career began in the mid-‘90s, when he released albums in his native Spanish. In fact, by the turn of the century, Iglesias was the biggest-selling Latin artist globally. His first album, the self-titled Enrique Iglesias, was released in 1995 after he got a record deal under a pseudonym. Iglesias did not want to use his famous name to get signed. By the time 1997’s second album Vivir was released, Iglesias was ready to embark on a world tour, with a backing band filled with veterans from the touring bands of Elton John, Bruce Springsteen and Billy Joel. Iglesias's albums in the early ‘00s would alternate between the Spanish and English languages, developing his international appeal while keeping his original Latin fan base satisfied. As the decade moved towards its conclusion, the albums Insomniac and Euphoria were released in 2007 and 2010 respectively. Iglesias's tour in 2011 and 2012 to promote the Euphoria album took in a range of venues across the world, including an emotional homecoming show in Madrid, dates in The O2 in London and The O2 in Dublin. Iglesias felt honored to take the stage at Madison Square Garden, a venue that he considers the greatest in the world. The tour was nominated for a range of awards, including Best World Stage Performance at the MTV Europe Music Awards, and it won the Super Tour award from Premios Juventud along with the Latin Tour award at the Latin Billboard Music Awards.